The Echo Dot is Amazon's most affordable smart speaker and the cheapest way to invite Alexa into your home. But, despite its compact design, low $50 price tag, and Alexa's intelligence, the previous two generations of Echo Dot suffered from sub-par sound quality and volume. For those who don't have another speaker to hook up, the louder, clearer, but equally smart and cheap Google Home Mini was the better option at this price range. All that has changed, however, with the new third-generation Echo Dot. 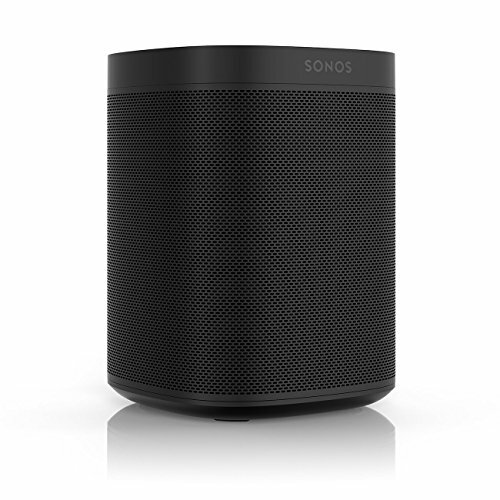 Still costing $50, this model is small and as smart as before, but now has a much larger speaker to produce better, louder sound. For the 2018 Echo Dot, Amazon has made big changes both inside and out. The Dot is still a similar shape to its predecessor, but is now wrapped in fabric instead of exposing its shiny plastic body. This fabric-first approach is similar to what we have seen from Google with its Home smart speaker range, as well as other speakers like the Citation range from Harman Kardon. This helps the speaker blend in more subtly with rooms like the lounge and bedroom, where gadgets like this are traditionally less common. Fabric-clad speakers like the 2018 Echo Dot can be placed on shelves and sideboards, nightstands and coffee tables, without looking out of place. Amazon is selling the new Echo Dot in black, dark gray and light gray. The former two have a matt black plastic top, while the latter is white. These are all completely inoffensive, of course, but we would like to have seen Amazon be bolder in its color choices. We understand Amazon would have to sell enough of each color to make them worthwhile, but pale shades of green, blue and purple, maybe even bright orange and red, would have given the Dot more personality. The fabric looks and feels identical to that used by the Google Home Mini, and with neither device carrying any branding we wouldn't be surprised if visitors who spot our new Dot try to summon it by saying 'Hey Google', or yell 'Alexa' at the Home Mini. Alexa's light ring is on top of the speaker, as before, glowing blue when the assistant is listening or speaking, red when the Dot's four microphones are muted, and green when being used as a household intercom with another Echo device. 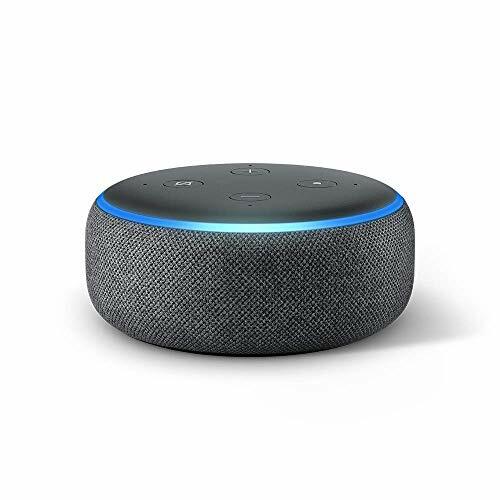 As with the last Echo Dot, the new model has four buttons on top for adjusting the volume, muting the microphones, and for making Alexa listen without you need to say her name first. At 99mm by 43mm, the 2018 Echo Dot is both wider and taller than the 84mm by 32mm Echo Dot from 2016. This is unlikely to be a problem for any buyers, as it still takes up almost no space wherever it is put. The new Dot is noticeably heavier, at 300g compared to 163g. This is in part due to the larger speaker inside, which we'll address in the next section. What's slightly less convenient is the power adaptor, which is larger than before. It's not so large that another plug can't fit in the adjacent or opposite socket, but it's bigger nonetheless. It also powers the Echo Dot via a proprietary cable instead of the micro USB connection used but the old Dot. So you can only use the plug and cable it comes with, not any USB cable you might have lying around. As before, the Echo Dot has a 3.5mm auxiliary port for connecting it to a larger speaker. You can also connect it to another sound system using Bluetooth, and there's Wi-Fi for hooking up to an internet connection, which is required for Alexa to work. Overall, the 2018 Echo Dot remains a compact and inoffensive smart speaker which should fit neatly into most surroundings. As we alluded to above, the previous Echo Dot wasn't a great music player. It was perfectly adequate for listening to Alexa and even talk radio, but playing music shone a spotlight on the limitations of its tiny 0.6-inch speaker. With a 1.6-inch speaker, the new Echo Dot is much louder than before. It also has more bass and its sound quality is generally much improved; it's clearer and doesn't distort anywhere near as much when the volume is increased. At first it's actually a bit of a shock to hear Alexa's voice with more bass, but you soon get used to it. We have tested the 2018 Dot back-to-back with a Google Home Mini and, although both are similar in terms of quality and loudness, the Dot has a little more bass. This will suit some listeners more than others, but to our ear it made some music sound a little muddy and lacking clarity. Thankfully, jumping into the Alexa smartphone app, then lowering the bass and upping the mid levels and treble goes some way towards fixing this. Of course, this is our personal preference, but it's good to know the app gives everyone the ability to make these changes. But one must remember this is a $50 device - not just a $50 speaker, but a speaker with microphones, Wi-Fi, Bluetooth and Alexa. It can control your entire smart home, if you want, making it still feel like excellent value. To further boost the Dot's audio performance you can buy two and use the app to make them work as a stereo pair, producing true two-channel music. Amazon also sells an Echo-branded subwoofer, but we feel this would be more suited to the full-size Echo and its more capable acoustics. With the 2018 Echo Dot, we felt we can up the volume without fearing about terrible quality, but it still falls short of offering house party levels of music output. At $50 and the size of a beer mat, you can hardly hold that against it. The Echo Dot's greatest trick is how it can perform exactly like any other Alexa-enabled device, including the $150 Echo Plus and $200 Sonos One. Alexa is Alexa, no matter which Echo device she lives on. This means your $50 Echo Dot can read out the news and weather, check your commute for delays, tell jokes, play games, flip a coin to settle an argument, answer general knowledge questions, play music, and control your smart home. Of course, that last point requires you to buy additional smart home product - like smart lights, plugs, locks, thermostats and other sensors - but the Dot and Alexa serve as a great on-ramp to building your first smart home. Pick up a smart plug (for less than $10 each, or Amazon now sells its own for $25) and you can ask Alexa to switch it on and off. Connect that plug to a fan, a heater or a lamp, and you have your first voice-controlled device. Through the Alexa app you can split these devices into groups and have Alexa control whole rooms at once, turning up the heating, dimming the lights and locking the door with a single command. Amazon recently updated the Alexa smartphone app, making it easier to install new Echo products and set things up with your smart home devices. This is also where you can split devices into groups and create routines, where one command has Alexa do several things at once. The 2018 Amazon Echo Dot is an excellent first step into building your first smart home. Alexa is as smart as ever and the device is almost as small as before, but with greatly improved sound performance and a design better-suited to the home. Even if you already own an Echo Dot, you should consider buying another because - as we have previously written about - having two or more Echo devices in your home unlocks extra features. The only sticking point here is Amazon itself and the company's new Echo Input, a device which costs $35 and adds Alexa intelligence (and microphones) to any speaker you might already own. If you don't have a speaker you want to Alexa-ify with the Echo Input, then the 2018 Echo Dot will be $50 very well spent.